The closer you get, the more unfamiliar it looks. Richard Artschwager has a well-developed facility for nudging ordinary objects into the shadowy realm of the phantom. From a landscape to hot water bottle—the specimen is ordinary, but the essence contains an intense perceptual chemistry. Artschwager transforms the familiar into an object-hood that is mysterious and elusive --just a hair's breadth beyond reach. As one perplexed art critic confessed in 1977; "…most curiously, instead of becoming more clear about what the chair looks like, one becomes less clear about it. It is surely possible to make a mental construct but the feeling grows that the mental construct has nothing to do with the chair itself." This exhibition includes 21 drawings from 2001 to 2003. Even from the cheap seats, you can see that Artschwager (in his 80th year) displays the subversive inventiveness of a twenty something. He's got the powerful chops of an art world veteran, and is more than capable of a few energetic riffs on his past. Stocked with the full range of eclecticism, these drawing offer the ideal vantage point from which to contemplate Artschwager's unique position in contemporary art. Richard Artschwager was born in 1923. He first exhibited in New York in 1959, and was represented by Leo Castelli for many years. His work has been seen in galleries and museums around the world, and continues to be highly regarded. In 2003, two retrospectives were organized by European museums --- the Guggenheim Deutsche Bank, Berlin and the Winterthur Museum, Switzerland. 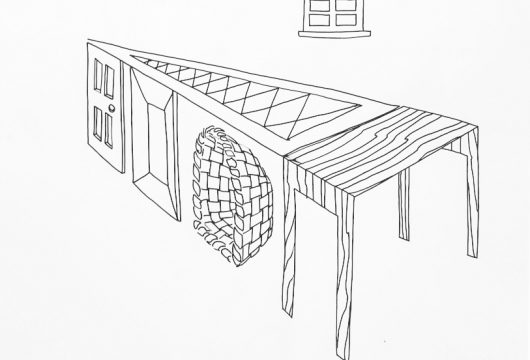 This is Artschwager's fourth exhibition of drawings at Nolan/Eckman Gallery. It will be accompanied by an illustrated catalogue with an interview of the artist by Carol Eckman, which will be available for sale during the exhibition.